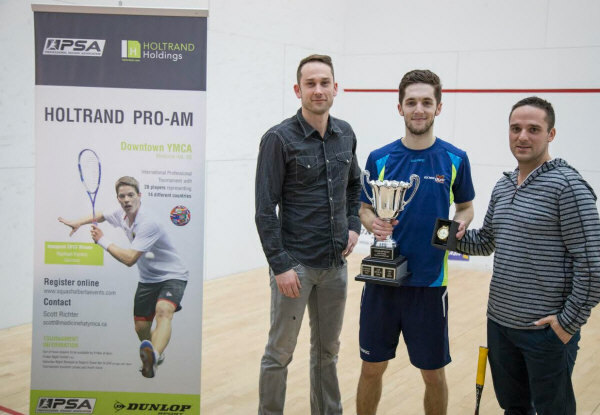 Top seeded Englishman Ben Coleman is the 2016 Holtrand Open Champion, defeating Canadian second seed Shawn Delierre in a three-game final that lasted over two hours! 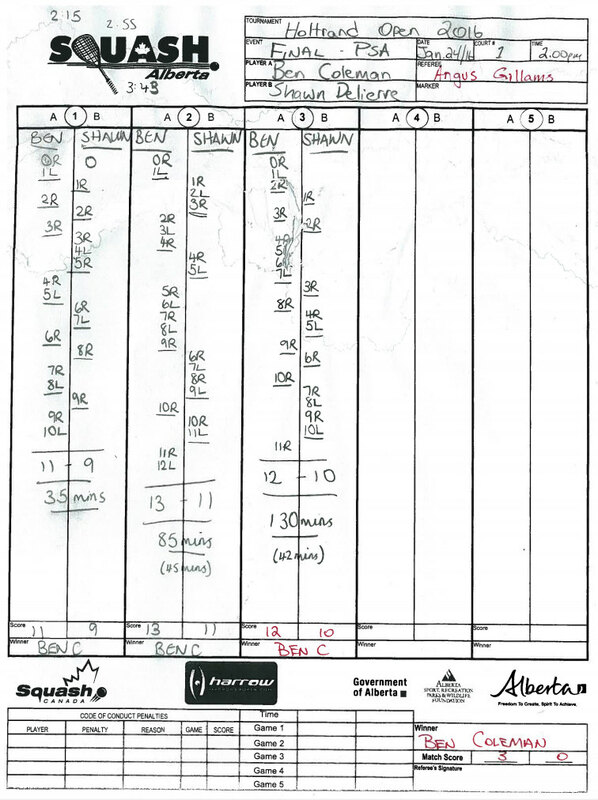 We have witnessed that Delierre can produce some extended matches and he showed the fans in Medicine Hat the longest three game match most of them had probably ever seen. Coleman was able to capitalize and battle through to the end with many broken rallies resulting in a Let Ball. Ben told the crowd after the match that it wasn't exactly the match he had hoped for, but it was exactly the win he wanted. 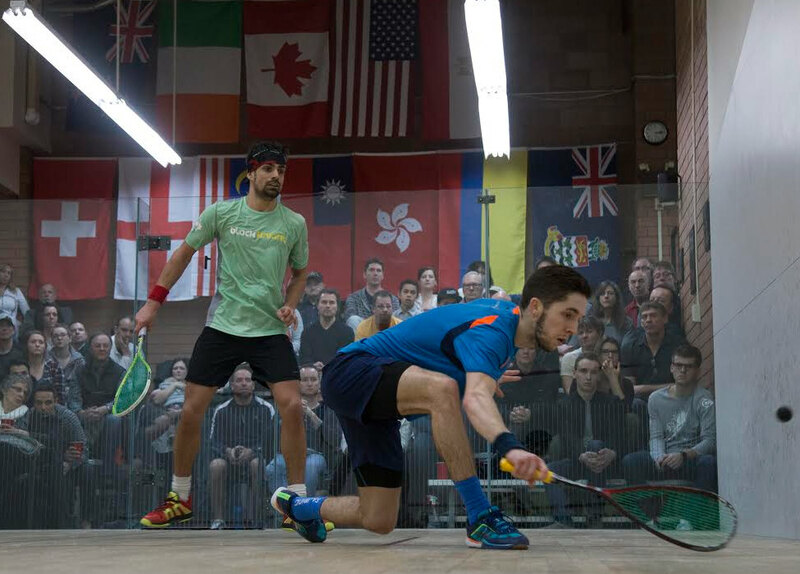 Shawn and Ben have played twice before this match; previously Delierre had taken the win so this was a big accomplishment for the Englishman, who claimed his seventh PSA title in the process. We had a blast as always having the pros in town, and we will be looking for new ways to enhance our tournament for the next round. Thanks to all the players that came from around the world to compete in Medicine Hat. The final will be between the event's top seeds after Ben Coleman came from two games down to beat fellow-Englishman Nathan Lake in 98 minutes and home favourite Shawn Delierre beat Reiko Peter in three close games. 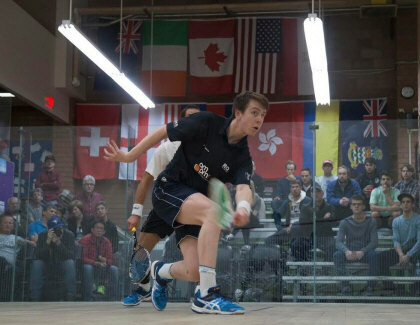 The top three seeds won through to the semi-finals in Medicind Hat, where they will be joined by sixth-seeded Englishman Nathan Lake, who procuced the only upset of the day in coming from two games down to beat fourth seeded Kiwi Martin Knight in a 105-minute marathon. That time was exceeded by third seeded Swiss Reiko Peter, who took 108 minutes to see off thechallenge of Angus Gillams, also in five games. 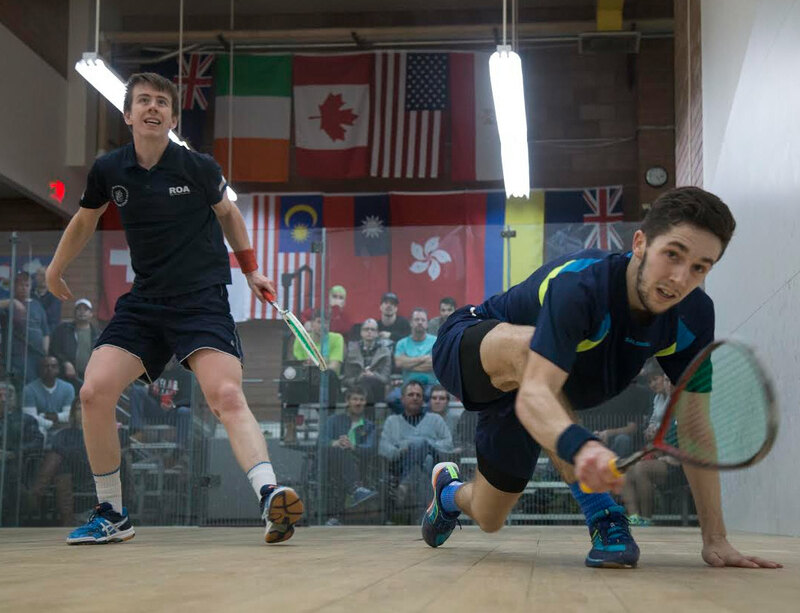 Lake meets top seeded compatriot Ben Coleman, who overcame Chi Him Woing in four games, for a place in the final, while Peter comes up against Shawn Delierre, the last Canadian left in the draw after a three-game win over compatriot Andrew Schnell. Note: A year after setting the record for the longest match ever against Leo Au, Delierre's win was the shortest of the round - a rarity indeed! 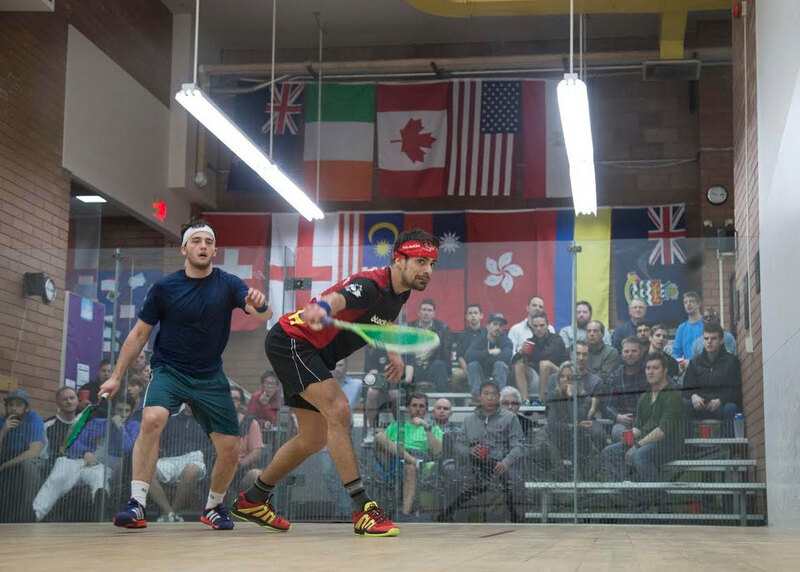 The top seeds safely navigated round one of the Holtrand Open in Medicine Hat, with with Chi Him Wong producing the only upset of the day as he beat eighth seed James Huang in the longest match of the day. 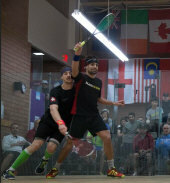 In the bottom section of the draw home favourites Shawn Delierre and Andrew Schnell set up an all-Canadian quarter-final. 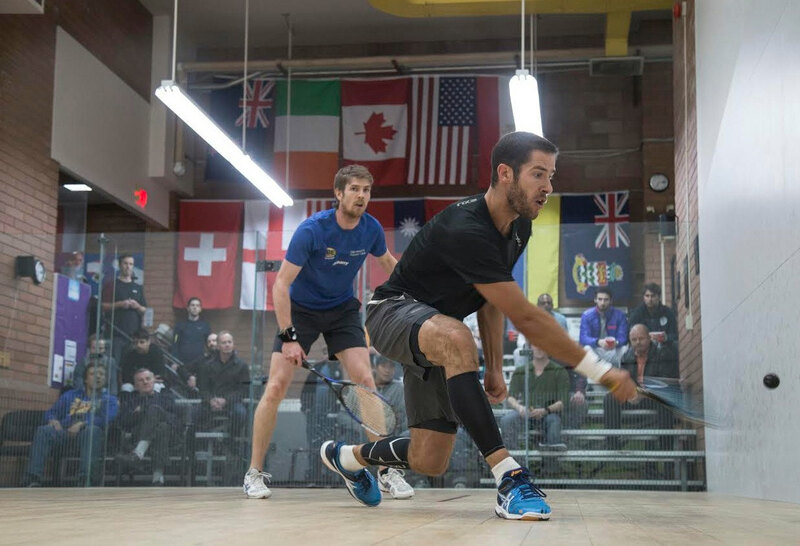 It was a good day for the home players in the qualifying finals of the Holtrand Open as three Canadians - Matthew Serediak, Nick Sachvie and Albert Shoihet - all won through to join Shawn Delierre, Andrew Schnell and wildcard Broick Janzer in the main draw. 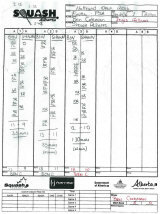 The bottom half of the draw features two all-Canadian matches, meaning that a home semi-finalist is already guaranteed ! A single qualifying round match as the 2016 Holtrand Open got under way in Medicine Hat. Matt Teel, being a full time realtor in Medicine Hat and an avid squash enthusiast, played extremely well against his full time professional opponent Jesus Ramirez. Taking the second game from Ramirez was a feat in itself, and keeping the rest of the games close enough to have a chance was very inspiring. Ramirez moves on to the qualifying finals tomorrow night.